Died: 20th November 1916; age 37; KiA. 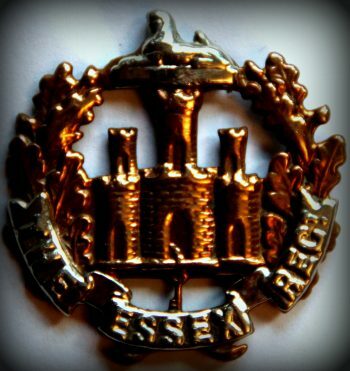 Regiment: Essex Regiment, 1st Battalion. 1881 78, George Street, Ipswich. George was 2 years old and living with his parents & siblings. James Alderton, 36, a Coach Body Builder, born Ipswich. Jane Alderton (nee Howgego), 32, a Machinist, born Ipswich. Ernest William Alderton, 12, born Ipswich. William James Alderton, 11, born Ipswich. Jessie Elizabeth Alderton, 4, born Ipswich. 1891 St. John’s Hill, Woodbridge, Suffolk. George was 12 years old and living with his parents & siblings. James, 46, a Coach Body Builder. Jessie, 14, a Dressmaker Apprentice. Edward Alderton, 8, born Ipswich. 1901 50, Hampton Road, Ipswich. George was 22 years old, a Printer’s Compositor. He was living with his brother Ernest, sister-in-law Emma & 5 year old niece Annie. 1911 53, Primrose Hill, Chelmsford, Essex. George was 32 years old, a Printer’s Compositor. He was married and Head of the Household. Nancy Maud Alderton, born 1909, Chelmsford, Essex. Jessie Alice Gilder Alderton, born January 1916, Chelmsford, Essex.